Find places to go skydiving in PA. Soar through the skies with skydiving PA.
Making skydives for nearly a quarter of a century, Endless Mountain Skydivers operates out of Skyhaven Airport, surrounded by beautiful mountain scenery and wide open farmland. Using only USPA (United States Parachute Association) Certified Instructors, Endless Mountain Skydives puts safety first while keeping all the thrills and fun. This Pennsylvania Skydiving group uses only the best jumpsuits, harnesses, modern square parachutes and safety gear. First-time tandem dives are priced at an unbeatable $205! Schedule your dive in advance! The PA skydiving center is open year-round, seven days a week. The Oldest Skydiving Center in Pennsylvania! Located in the foothills of the Pocono mountains, this PA skydiving center is a one-of-a-kind experience! Operating since 1961, Above the Poconos Skydiving Center is the oldest continuously running, USPA-member skydiving center in the world! With a variety of top-class instructors to choose from, your dive is sure to be a safe and unforgettable experience. Above the Poconos Skydiving is available for skydiving lessons, exhibition skydiving, free fall photography, and government-certified parachute rigging. 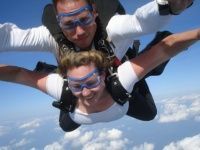 First-time tandem skydives start at $224, with photography and DVD add-ons available at an additional cost. Plus, the skydiving center in PA is available year-round! Have you ever wanted to feel the exhilaration of speeding through the air? Or experience the freedom and view normally only afforded to birds? Then skydiving in Pennsylvania is for you! With more than ten years of experience, Skydive Happy Valley has highly trained Jump Masters and an impeccable safety record. 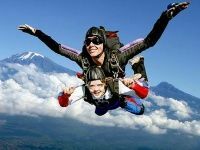 A tandem skydive gives you the amazing experience of skydiving with very little instruction needed. 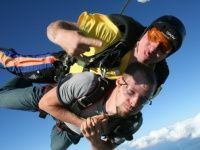 First-time tandem skydives are $215, with the option to videotape the jump for an additional $95. Happy Valley is open year-round, so call to book your aerial adventure today! Skydiving in Pennsylvania is an Aerial Adventure! Keystone Skydive Center offers safe dives for first-time divers to experienced veterans. Highly trained, friendly staff will help you; whether it's a tandem dive, accelerated free fall, or instructor-assisted deployment. All instructors are certified and rated through the United States Parachute Association. Keystone offers two separate student programs after your first jump to train you to be cleared to jump without supervision. Tandem first jumps start at $224, with discounts on return jumps. Call ahead to reserve your jump time. Gift certificates are available at this Pennsylvania skydiving center for that friend or family member with an adventurous streak! One of the Best Skydiving Centers in Pennsylvania! Skydiving in Pennsylvania is the perfect activity for those craving adventure and exhilaration! With less than an hour of instruction required before your tandem jump, you can enjoy the feeling of flying through the air, all while securely strapped to a certified instructor. 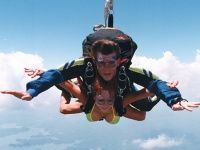 Safe and exciting, tandem dives at the Chambersburg Skydiving Center start at $229. All of the instructors are certified by the United States Parachute Association, and the aircrafts are maintained and operated by FAA certified pilots and mechanics. Chambersburg Skydiving Center also offers Instructor-Assisted Deployment, Static Line jumps, and Accelerated Free Fall. Chambersburg is open year-round! Call for reservations! A Unique Pennsylvania Skydiving Experience! This small skydiving center in PA will give you skydiving instruction with a difference. Freefall Oz believes in spending enough time with each student to ensure that they are completely ready for their first skydive. This individualized attention helps to ensure comfort and safety, and makes the experience fun for all. Tandem jumps from 10,000 feet start at $270. 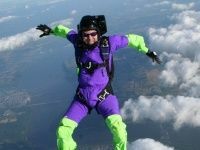 Freefall Oz also offers an Advanced Free Fall Progression Program, which is geared toward helping you become a skydiver. Make a weekend of it and stay at the charming Oz's Homestay Bed and Breakfast! Set on 122 acres alongside the Oswayo River, this is truly a wonderful place to retreat and enjoy nature. PA Skydiving with a Great View! Sky's the Limit is a USPA certified Pennsylvania skydive center. Enjoy the thrilling drop from 13,500 feet in your first tandem jump! You will experience the awesome view of the Pocono Mountains, Delaware Water gap and the New York City skyline. Tandem jump prices start at $195. Sky's the Limit also offers further skydiving training with its Accelerated Free Fall Program and its Advanced Free Fall Program. 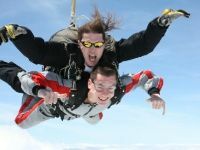 The skydive center is surrounded by additional attractions including skiing, horseback riding, and paint-balling. As the closest PA drop zone to NYC, Sky's the Limit is ideally located for a weekend getaway. Unforgettable Skydiving Experience in Pennsylvania! 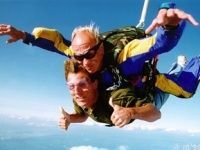 Skydive Pennridge offers two ways to make your first skydive! Choose to do a skydive in tandem with a certified instructor and minimal training, where you will free fall for 4,000 feet and then float another 10,000 feet to the ground all while your instructor is strapped securely to you; or choose to do the more extensive training program with a 4-6 hour instruction period and then do a jump where you will have the opportunity to deploy your pilot chute on your own and (with radio assistance) control your solo parachute descent back to the drop zone. Skydive Pennridge is a PA skydiving facility with state-of-the-art equipment and a dedication to safety and fun. Call to book your dive now! Skydiving in Pennsylvania is an Exhilarating Experience! Skydive Pennsylvania is a USPA certified facility which boasts the most progressive training program in Pennsylvania, even exceeding USPA standards. They offer Tandem or Static Line jumps starting at $235. Tandem jumping is a wonderful way to jump without nervousness or fear. 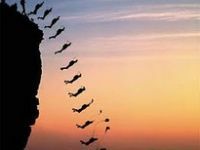 For the slightly more independent, Static Line jumping involves a higher level of freedom, and a longer training period. Static Line jumpers will dive from 4,500 feet - a height very few skydiving schools will offer for this type of jump! Call to book your skydive now! 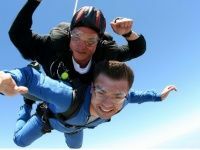 A skydiving gift certificate makes the perfect surprise for a birthday or graduation. Skydive Pennsylvania also provides sales and service for BASE jumping equipment. Skydiving in PA that is Sure to Delight! 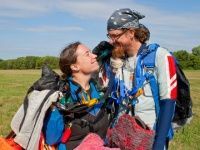 Maytown Sport Parachute Club, one of the oldest skydiving clubs in the United States, is a friendly skydiving center that offers packages for experienced skydivers, as well as training for first-timers. All instructors are USPA certified and are dedicated to safety, enjoyment and making sure you have all the skills you need to skydive comfortably. Training and tandem jumps are $220 with discounts on future jumps. This PA skydiving club also offers a Video/Tandem Package for $330, OR if you're not sure skydiving is for you, pay a small fee to take a plane ride in one of their Cessna 182s and have a look around!